It all comes together when Achilles’ head bursts into flames. Life and death, revenge and hate, righteousness and evil, glory and fate. The voices of the Muses strain to the point of breaking as their song empowers Achilles with supernatural radiance. and forth from the man made blaze a gleaming fire. In unrestrainable grief, Achilles mourns for his beloved Patroklos, trusted chariot driver, brother in arms, his friend with whom he shares everything, especially his heart. Lost to the heat of battle, laid low at the hand of Hektor, slain of life and stripped of armor, his beloved is lost to the ravages of war. The quaking volcano within Achilles finally erupts. Fountainheads from within both angry eyes shoot forth beams fueled by the uncontainable energy of Achilles’ explosive wrath. Shining beams of sanctified light shoot forth from his head like Athena from the forehead of Zeus. Exploding with uncontrolable emotions, the supernatural light streams unabated from Achilles’ head even as his goddess mother, Thetis enters with a full set of new armor fresh from the forge of Hephaistos. and they all rang aloud in their splendour. but they shrank in fear. she went back to the house of her mighty father. for his grief was greater than he could bear. the armor that Hephaistos had made him. and next he did on the breastplate about his chest. that shone afar with a splendor as of the moon. While comparing the flashing light shining from the radiant shield of Achilles with a blazing beacon fire seen by storm-tossed seafarers, there are several angles from which interesting views may be perceived. This beacon, situated on a high hill overlooking the sea, sends out a stream of light that Homer compares to the moon. Achilles offers himself as the shining savior of the Achaeans in the ultimately defining moment in the war against Troy. Likewise, his blindingly radiant shield offers an ultimate resolution to the ravages of war. 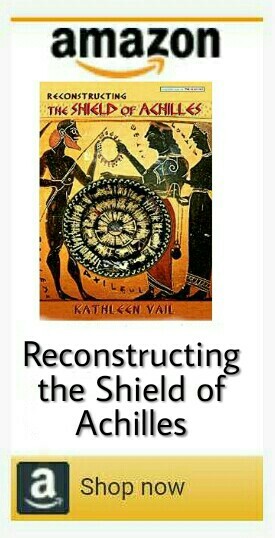 Exploring the significance of Achilles’ shield as a metaphor for Peace, it becomes evident that Homer offers Achilles’ shield as the quintessential weapon of defense, earnestly defending the shining principle of Peace. George Sandys’ The Castles Commanding y Hellespont, 1615. Restored and colorized by K. Vail. Only Achilles can look upon his new shield without fear. He is already blind, enraged, enwrapped in grief, and focusing fully inward on this final, fateful moment. Oblivious to everything around him, Achilles continues arming. that Hephaestus had set thick about the crest. It all comes together in this one climactic moment. Flames from the Achaean ships are glowing in the sky, Achilles’ eyes are shooting fountains of fire, his golden helmet is a beaming beacon, and shining reflections from the glorious new shield are blinding everyone present. This phenomenal display of supernatural fireworks lighting the night sky on the shores of Troy is signaling the culminating, epic will of Zeus. This is the moment Achilles is born for. It is also the moment signaling his death. But does he really die? The powerful beams of metaphysical light emanating from Achilles is supercharging his kleos, radiating his existential glory. Traveling immeasurable light years beyond his epic death, even today the kleos of Achilles is still shining, still expanding, still fueled by the uncontainable energy of a radiantly human hero. Protected by Ares, Achilles Overwhelms Hektor. By Antonio Raffaele Calliano, 1815. With this inaugural post, it all comes together for theshieldofachilles.net. Welcome! The overarching vision is to see this site flourish as a forum for exploration, a symposium in honor of the unfading kleos of Achilles. The applications of Homer’s genius are gold mines for deep explorers, from archaeology to literature, art to technology, religion to science, ancient warfare to today’s wounded warriors, and so much more. I hope you will join in; all relevant topics are open for discussion and all points of view are welcome. Comments, criticism, questions, links to relevant sites that you enjoy–all are welcome and happily encouraged, so please have your say in the comment section, below. Also, please feel free to submit guest posts. This is an open invitation and is displayed prominently on the home page. All appropriate submissions will receive a fair review and may be lightly edited to meet site formatting and grammatical standards (great tips here). Unfortunately, payment for guest posts is not available at this time. However, author bios are published with articles, and all rights are retained by authors upon publication here. Please submit proposals or complete articles of 2,000 words or less to: kv.achilles-at-gmail-dot-com. *Gregory Nagy, Classical Inquiries, Harvard University Center for Hellenic Studies, A Sampling of Comments on Iliad Rhapsody 19, December 1, 2016. Wow, this is fantastic! Very detailed and interesting. I love it. Thank you for sharing! A very interesting post. Enjoyed reading your post.